The Electronic Frontier Foundation released its 2015 report, Who Has Your Back? 2015: Protecting Your Data From Government Requests. The report analyzes technology companies and their information disclosure and collection policies as well as highlighting best practices. The companies then receive a star for each area where they scored highly. 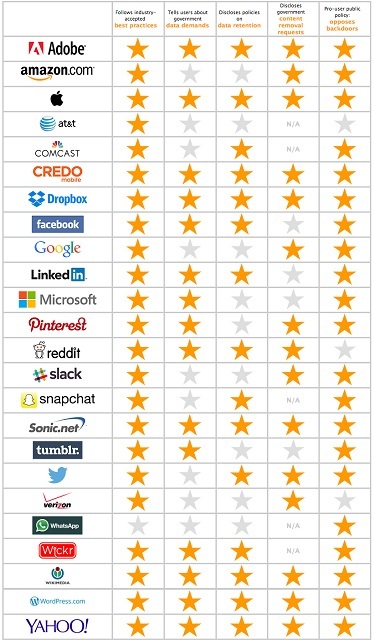 Based on the report, majority of tech companies are opposed to government interference and requests. In the 2015 report, nine companies including Adobe, Apple, Dropbox, Wikimedia,Credo,Wickr, Sonic WordPress and Yahoo received all the stars available. This was based on metrics of best practices for security, publicly opposing back doors, disclosing government data demands, content removal requests, and making data retention policies public. Not all companies are embodying these practices with US based Telcos, Verizon and AT&T—received especially poor results. An interesting addition to the companies that performed poorly includes messaging application, WhatsApp. WhatsApp poor score was as a result of not releasing public information on data retention and government data requests, alongside not following industry-standard practices. Facebook which owns WhatsApp scored relatively well in the report. Whatsapp received just one star for its pro-user policy that prevents back doors. The publishers of the report say they gave Whatsapp a full year to prepare for its inclusion in the report but failed in adopting the best practices considered in the report. Currently, WhatsApp does not publicly require a warrant before turning over user content or have a published law enforcement guide and transparency report. To mitigate this, Whatsapp needs stronger policy aimed at informing users of government data requests as well as offer disclosures on data retention. The Company’s CEO and co-founder Jan Koum announced a few months ago that the platform has 800 million monthly active users. Facebook CEO Mark Zuckerberg set a goal of 1 billion monthly active users before the platform could begin monetization. If any of this is to be achieved, the platform needs to invest more in the privacy and protection of user data.